I moved to Pennsylvania some years ago now and I have to say that I do often find some of the most delicious food in this State. 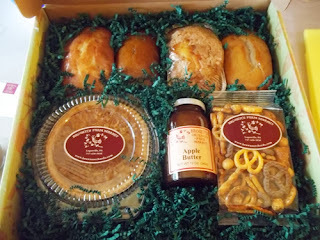 Recently, I discovered Brown's Orchards and Farm Market in Loganville, PA and the folk there were nice enough to send me a gift box to get a feel for some of the goodies they have to offer and I was not left disappointed - in fact, I wanted more! See, not only does Brown's Orchards and Farm Market have great, fresh picked fruit on site, but they can send it to you, too alongside bakery and gift items, with which you just can't go wrong! 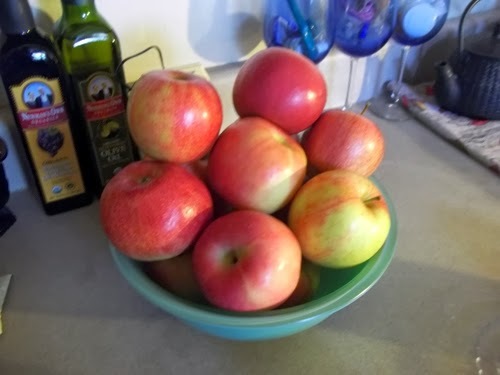 I received the wonderful double tiered gift box, just a day or so after it was shipped, containing some of THE most amazing looking apples I think I have ever seen! There were 16 of them in the bottom layer and they were packed secure as not to be jostled around in transit and so that they reached me in as perfect a condition as they possible could! The top tier of the box contained a plethora of goodies that I can hardly put into words without sounding incredibly cheesy but, presented in front of me were several delights including a coffee cake, banana bread, pumpkin bread, cherry cake, mixed pretzels, a pecan pie and a jar of apple butter! I didn't very well know where to begin with so many things to choose from but I will admit that the coffee cake was the first to go! It just looked so inviting sitting there in its pan that I could not resist! I put the kettle on and made a cup of tea and I had a slice (or two...) of the cake and oh. my. gosh - AMAZING! 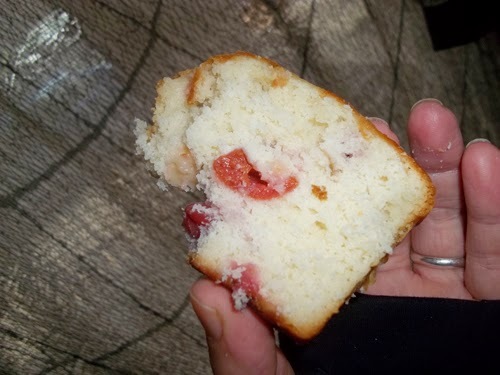 The cake was soft, moist, sweet and delicious and just so fresh. It tasted like nothing I have ever purchased at a grocery store and it just made my taste buds light up! Similarly, my husband, who is not one to compliment food all that often, tried the pumpkin bread and thought that it was so delicious he actually ate the whole thing to himself and demanded that I immediately order more! They are THAT good! The cherry cake/pudding too! I am not sure in which order everything else was tasted but I do remember that the pecan pie was absolutely to die for! So sweet, gooey and nutty with a light, crisp pie shell to hold it in! Every single little bite was a little bite of heaven with a sticky hit at the end finished only with a smile! I can not even imagine how they make their pecan pie so good, but I can tell you that I have never had one that tasted so good before or since and I just know I will have to get another before the year is out! The pretzel mix was a family favorite snack and everybody loved the mix up of various different kinda of pretzel pieces and chocolate covered pretzels! Very moreish and one of those foods you don't quite realize how much you've snacked on before the entire bag is gone and it is too late! Definitely a winner! The apples, as I mentioned before, were ridiculously tasty! They were bigger than the size of my fist and so bright and colorful! 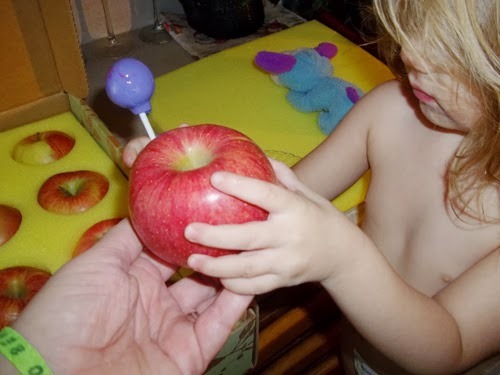 My children adore fruit and apples like this make them quite excited! They helped themselves to one here and another there and the general consensus was the same as I had already concluded - these apples were some of the tastiest, juiciest apples we'd had in a long time and my 2 year old declared them as: "Yummy!!" As for the apple butter - I just can't get enough! I make rolls from scratch almost every morning and usually I will add a little butter and jam or a little Marmite even, but the apple butter on a fresh-out-of-the-oven roll is just divine and makes any morning tea that little bit happier! Overall, I have to say I just can not find a single fault with this gift box and I would be delighted to give or receive one of these for any occasion, and what better time to give than over the holiday season, which is just a hop, step and a jump away around the corner! Yes! That's right! You might not have to wait to try out one of these gift boxes for yourself because the good people over at Brown's Orchards and Farm Market is giving you, my dear readers, the chance to win one of their Farmer's Feast, Fruit & Bakery gift boxes valued at $64.95! To be in with a chance of winning this fabulous gift box, just enter via the rafflecopter, below! You must be resident of the U.S and 18+ to win and have completed each entry you submit correctly in order to win! No option on the rafflecopter is mandatory so please enter as many or as few as you like, and come back daily to collect your extra entries for tweeting!! Note: Mom's Gone Bronson is not responsible personally for prize fulfillment. This responsibility lies with Brown's Orchards and Farm Market. This prize can NOT be shipped to California or Arizona! Sorry! While you're waiting to see who wins this great prize, why not head on over to Brown's Orchards and Farm Market and check out their events pages if you are local to the area or planning a visit close by in the near future! Take a look at all they have to offer including their cafe/coffee bar, which I would be happy to pop in to if you'd like to take me along, too!! You might also like to check out our Brown's Orchards and Farm Market 'Snack Attack' gift box giveaway, located HERE! Disclaimer: I was provided with gift boxes to review for this post. I was not monetarily compensated and my views are open, honest and my own. Your views may vary. Thank you! I want to dig into that Apple Butter! YUM!! !